Many people wonder if you can get amaryllis bulbs to rebloom. Yes! It’s easy because amaryllis are forgiving plants. Amaryllis benefit from a summer outdoors. For best growth and bloom potential, remove them from pots and plant them in the ground. Blooming amaryllis bulbs make spectacular holiday gifts and recipients invariably want to keep the plants in hopes of a repeat performance and to honor the gift-giver. Fortunately, amaryllis are forgiving plants. All they need to bloom again is a season in the garden to replenish the bulbs. Giving the bulbs a summer vacation of fresh air, sunshine and moist, fertile soil is the best way to keep them healthy and to increase their size and flowering potential. Amaryllis thrive best in bright, indirect light. After the blossoms have faded, cut off the flowers, but leave the stalk until it withers. If any leaves have grown, leave them alone. Continue to water and feed the plant regularly with a liquid houseplant fertilizer, such as All-Purpose Plant Health Care. In spring, when the danger of frost has passed and daytime temperatures are above 50 degrees F., you can plant your bulb outdoors. It’s important to give it a slow transition to outdoor living. A couple of weeks of protected exposure to the sun and wind will prepare the bulb for life in the garden. For the first week, put the potted plant outdoors in a shady place out of the wind. If nighttime temperatures are predicted to go below 40 degrees F., bring them indoors in the evening and set them back out in the morning. In the second week, introduce them to morning sun or full exposure on cloudy days. Continue to protect the foliage from hot midday and afternoon sun. Keep the soil in the pot barely moist during this transition time. After the transition time, it’s safe to plant the bulb in the ground. Choose a site with well-drained, fertile soil that gets four to six hours a day of morning sun and afternoon shade. Avoid hot, sunny areas. To encourage strong root and bulb growth, mix some granular fertilizer into the soil. Be sure to follow the recommended application rate. Tip the plant carefully out of its pot and gently unwind any circling roots. 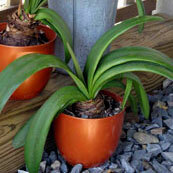 Set the plant into the garden soil so that the neck of the bulb is an inch or two above ground. Backfill with the amended soil, firm it gently, and water thoroughly. During the summer, protect the plant from slugs and snails. Feed with liquid fertilizer every six weeks. Keep the soil moist, but not soggy. The goal is to keep the bulb growing vigorously. Strong foliage feeds the bulb and produces more flower stems and buds. In late summer, usually by mid- to late August, stop watering and fertilizing the amaryllis plant. Let the foliage die back naturally, but protect it from freezing. In September — or if frost threatens — dig the bulb from the garden and plant it in a pot indoors. Trim the roots only if necessary to get the bulb into the pot. 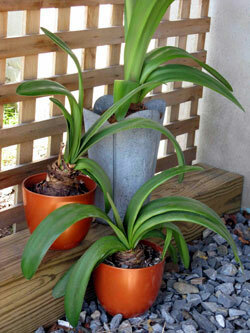 For detailed potting instructions, read How to Pot an Amaryllis Bulb. Let the soil in the pot dry out and the foliage die back. Store the bulb in a cool, dark and dry place for a minimum of two months. About five to eight weeks before you want the amaryllis to flower again, resume watering — sparingly at first. Once you see sprouting, increase watering and place the pot in a cool place with bright, indirect light. I have potted amaryllis in larger pots with good soil and fertilizer and gotten several years of blooms but never tried to put them out in the garden in the summer. Are they tempting to any of the common garden pests (all of which live around my garden; squirrels, deer, rabbits, woodchucks, racoons)? I bought a garden center amaryllis more than 25 years ago. Since then, I have had blooms every year from the original bulb at first and then it’s couple dozen offspring. After they flower in the spring and the danger of frost is past, I cut off the stalk and plant them in full sun in my garden. I have never noticed any problem with bugs/insects or animals bothering them. I make sure they have water but otherwise basically ignore them until late Sept. or early October when I dig them up, dry them and store them bare-root in a dark cool spot in my basement. Around February or March I pot them, enjoy their spectacular blooms and then start the cycle all over again. I am in north Florida. I have planted amaryllis repeatedly for the past ten years, only to have the six-inch-long grasshoppers that thrive here shear the leaves off of the plants every single year. The result is never having any blooms at all. All it takes is one grasshopper to kill every plant in one day. I have an amaryllis plant that produced a seed pod last year. I let the pod dry out and saved the seeds. What is the process for getting them to sprout? When should I plant them? Last january we bought an amaryllis in a box, it grew great leaves but never flowered. late winter the leaves collapsed and I figured it died so I put the pot outdoors and forgot about it until one day I noticed it had regrown huge leaves. It’s not January again, still has great leaves but no sign of blooming. Here in Louisiana, I have grown amaryllis in the ground for years. The last two years, however, has seen the large grasshoppers (called Lubbers) arrive. They seem to consider amaryllis candy. This year I killed at least a hundred, and many of my amaryllis had more foliage survive than last year. I am hoping for more flowers this year, but those grasshoppers can really be a problem. Thanks for the timely information. I received an amaryllis bulb last Christmas and it bloomed 3x –around late January, March and May–the last time I cut the stalk, I thought I should let it “rest” so put the pot in the basement. I re-potted it after Thanksgiving this year (2011) and it’s still alive, but only has a small stub of green on the tip. Guess I should have put it in the garden instead of the basement! I’m guessing that if I continue to fertilize it, it will gain enough energy to bloom again. Trying this again. I plant my amaryllis in my whiskey barrel planters with my annuals and forget about them until fall. They thrive with the fertilizer and water that i give the annuals. I let them get a light frost, dig them knocking off the dirt and store them in my basement. I like to take mine out the first part of January so i can enjoy them around the end of February. I have pretty good luck with them blooming. Occasionally i will have one that does not bloom, but not to often. Every year, for many many years, my cousin would send my mom an amaryllis bulb for Christmas. 5 years ago, when mom moved into a nursing home, I found all the dried up bulbs in her garage. Took them home, put them all in one pot, and they grew and bloomed by January. I’ve moved them outside, in the pot, with all the foliage, every summer, and let them just be green for months. Before it freezes, I cut off the foliage and just bring them indoors. This year, I finally split the bulbs into two pots (must be at least 10 bulbs). I see they are now sending up their leaves. I don’t think anything can kill them. If I could post a picture here, I would show you last year’s blooms. Question — After my new Amaryllis bloomed last year I followed directions given by the catalogue company: trimmed the stalk, watered the leaves all summer (inside, in the original pot), and took it to the basement in Sept. In Dec. I brought it up, repotted, and have Really, Really tall leaves, but no bloom stalk at all. What did I do wrong — and will this bulb ever bloom again with proper care? If you didn’t get your amaryllis to bloom again, don’t give up. The key thing to remember is that you want to help it grow a lot of leaves during the summer. Fertilization will help. Also make sure it doesn’t get too dry. A friend of mine always transplants his bulbs directly in the ground in a semi-shady part of his yard, where they spend the summer. His bulbs bloom beautifully every winter. When I moved into my rent house, the landlord told me his wife used to have amaryllis behind the house. It was summer then. I went out back and found an entire bed of them overgrown with weed vines. I waited till fall when the leaves died back, then I dug them all up and moved them to a new flower bed in front of the house (the east side). I had built up the bed to be raised about 6 inches above the red clay soil around it. I dug it about 12 inches deep and added lots of compost to the soil. The amaryllis did not bloom that year, but the next year, they bloomed gloriously, and have every year since, without having to dig them up every year. If a hard freeze is predicted, I cover them with fall leaves and they do fine. Last winter the ground froze about 6 inches down, but they did fine. I haven’t had any grasshoppers (thankfully) and the flowers are gorgeous in the mass planting. I lived in north east Texas near Tyler. I live in Southern California, so I leave my amaryllis in the ground all year. I water when weather is hot, put compost around the plants, they bloom and multiply, will need to thin them out. Hi! I have already cut the remaining leaves off my amaryllis to preserve only the dry bulb until next December, when I was planning to plant it again. Is that possible? The bulb is still in the pot and I have not cut off the roots around it. I live in Ohio so planting it in the garden now is out of the question, and I really don’t want to keep the live plant throughout the year. Now my choices are: store the trim the roots and store the dry bulb in the basement or store the dry bulb as-is in the basement. Or, if it is too late, throw it away. If you cut the leaves off, it will be impossible for the bulb to grow and produce another flower. So, it can’t “hibernate” all summer as a bulb in a bag, in my basement? 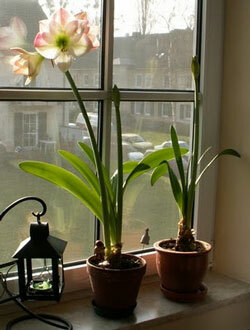 As detailed in the post, you have to grow the amaryllis through the summer, trying to get as many leaves as possible. You should fertilize it, too. It needs the leaves to grow and replenish the bulb so it can bloom again. Without the leaves, the bulb will not be rejuvenated. I live in Alabama, and my amaryllis stay in a large flower bed outside all year long. I usually cut off the leaves in early October. Years ago, I just left the leaves until the frost killed them. Which would be better? I have lots of amaryllis blooms every year, but I do not want to kill any by cutting the leaves too soon. Thanks. I have a somewhat different question. I have a beautiful red amaryllis that is about 10 years old. The original bulb is hugh, 6-8 in in diameter and there seem to be some new, smaller bulbs around it. I plan to move and I really want to take my Amaryllis with me. It will likely be after the blooms have faded, but before cool weather. That is early to dig them up, but will it survive i I dig it and pt it i a really large pot , about 20″ across ans 24″ high? I have several Amaryllis plants (in South Carolina) that were planted in large planters around the deck many years ago. Each year they bloom magnificently and have always bloomed pink and white – until this year when they bloomed deep red! What caused the change in color? I live in Southwest Florida (zone 9). By reading the above post it sounds like I can plant bulbs and leave them in the ground for them to come up every year., If I plant them now (end of March, first of April) when will they come up? The following year, when would they come up and how long would they last? Hello, I was at Walmart when I saw these bulbs for sale. It’s the end of October here in Austin, TX and the weather is cool at night with mid 80’s during the day and slowly getting colder. There is about maybe 2in of growth above the actual bulb and it still looks green. Some of the other colored bulbs at the store had growth. My question is: what do I do now? Do I “store it in a dark spot and water occasionally or since I live in Austin do I put it on a window seal and water it like I’m wanting it to bloom? If you just purchased an Amaryllis bulb this fall you should be able to get it to bloom by placing it in the window and watering it to bloom. However usually bulbs sold to bloom for the holidays usually do so within 6-10 weeks. You may want to read our article on Amaryllis care for help with this! I have outdoor amaryllis, and they do great in one spot of the yard. We planted some somewhere else, not so great. In transplanting so they are all together, I oh my goodness, cut one in half with my shovel! They were not planted correctly, which could be why they weren’t doing well. But my question is, will my bulb survive? I dug up a clump of amaryllis about 50 bulbs. It’s September. I cut off the leaves before I dug them up. Did I ruin them. Should I put them in pots or store in a cool dry place for 10 weeks? I wanted to give them as gifts around Christmas time. It sounds like the plants had the summer to grow lots of foliage to replenish the bulbs, which is great. Ideally, to help amaryllis get ready to rebloom you want to cut back on watering until the foliage starts to die back naturally. However, this is much easier when they’re growing in a pot, rather than in the ground where they’re watered by rain! I would shake off excess soil and put the bulbs a in a cool, dark place, where they can dry out a bit, and let the bulbs rest. It’s possible they won’t want to rest and will just resprout! So I’d check on them every week or so and if any of them are determined to regrow right away, I’d pot them up and see what happens. It’s possible you’ll have some in bloom in October or November. But perhaps others will take the cue and rest. My amaryllis lilies in pots have been attacked by black and red pests. All the leaves have been eaten. So I have cut the leaves. What should I do to ensure there are no eggs around. Should I remove the bulbs and repot them? Please advise. I had 8 bulbs that all flowered last Xmas. I kept them outside and they all grew long leaves and did well. After reading on how to store them for 6-8 weeks, I was unsure whether to leave in pots or remove them and rinse off. When I decided to follow the rinsing off method, I unfortunately found 2 of the bulbs had been eaten by what looked like maybe some kind of catipillars (3/4 inches long) that had cocooned themselves up inside and all through the centre of the bulbs destroying them. I only read about grasshoppers and deers, so far. And all the pots were together outside but the other 6 were fine. Any ideas? I’m not sure what type of pest is munching on your amaryllis bulbs; it appears there are several types of caterpillars that like to bore into amaryllis bulbs. Glad the other six seem okay; I’d quarantine them away from the infested ones and keep a close eye on them. You don’t want any sneaky larvae getting indoors and maturing into moths! I received a giant amaryllis bulb for a Christmas gift. It is blooming beautifully! It look as though it’d in some kind of wax. Directions say not to water or do anything. Question is: what can I do with it after it’s done blooming.